I am thrilled to be part of Sacred Texts/Contemporary Forms: Spiritual Traditions in a Digital Age, curated by Leslie Fedorchuk, at the Milwaukee Institute of Art And Design. "The works in Sacred Texts/Contemporary Forms represent such faith traditions as Buddhism, Christianity, Baha’ism, Hmong shamanism, Islam, Judaism, Maya and Wicca. They are as simple as penned books in an indigenous Spanish dialect by a shaman from Chiapas, Mexico, and feather “books” by an Ojibwa from St. Ignace, Michigan, that are more sculptural objects than traditional books. But they are also as detailed and crafted as seven digital facsimiles from the Saint John’s Bible, the first bible to be written and illustrated in the Benedictine monastic tradition in more than 500 years. 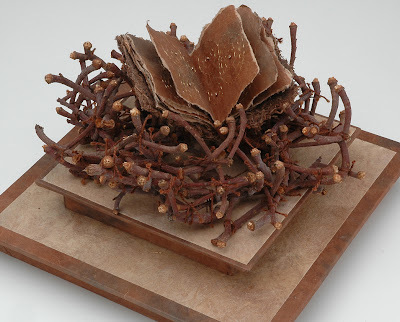 Commissioned by Saint John’s Abbey and Saint John’s University, the bible has been created using ancient techniques (eggs, quills, calf-skins, and hand-ground inks with gold, silver and platinum) combined with modern touches, such as strands of DNA gracefully entwined up the branches of Jesus’ ancestral tree, to produce a contemporary masterpiece. And they include the idea of the book as an interactive object in a variety of ways, including four ancient texts that viewers can manipulate on a kiosk.